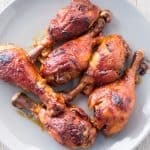 Perfect, fall-off-the-bone barbecue chicken with just 3 ingredients in 3 easy steps. Marinate. Add chicken and dressing to a gallon-sized Ziplock bag and marinate for at least one hour (preferably overnight). Cook. Add trivet to pressure cooker. Pour all contents of bag into Instant Pot, lock lid, cook for 20 minutes at high pressure. Once cook time is complete, allow pressure to naturally release (about 30 minutes). Meanwhile – pour BBQ sauce into a medium-sized bowl. Preheat oven broiler on high. Char. Carefully individually remove each piece of chicken from Instant Pot with tongs. As you remove them, dip in the BBQ sauce and place on a lined baking sheet. Then place baking sheet under a high broiler for at least 5 minutes, but basically until you have the desired char and caramelization.